How to create Excel 3D surface chart in C#, VB.NET? This article explains how to create a 3D surface chart in Excel using XlsIO. What is a 3D surface chart? 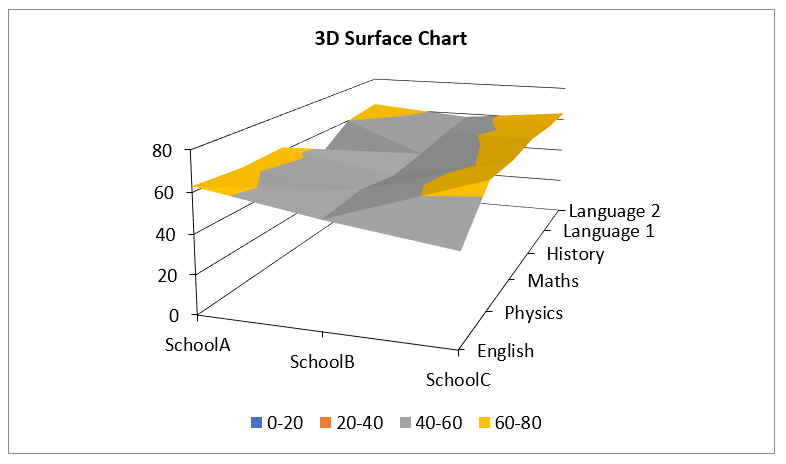 3-D Surface chart shows a 3-D view of the data, which can be imagined as a rubber sheet stretched over a 3-D Column chart. It is typically used to show relationship between large amount of data that may otherwise be difficult to see. Color bands in a surface chart indicate the difference between values. To create a 3D surface chart in Excel using XlsIO, you need to do the following steps. Create a chart object by calling the worksheet.Charts.Add method. To plot the series values in column and categories in row, set chart’s IsSeriesInRows property to false. Set a range of data from the worksheet to chart’s DataRange property before specifying the chart type. Specify the chart type to ExcelChartType.Surface_3D enum value. Note: For creating a 3D surface chart, the series count must be greater than or equal to 2. The series should be set before selecting the chart type. To modify the depth axis of 3D surface chart, use the PrimarySerieAxis (Depth Axis) property. The following C#/ VB.NET complete code snippet shows the creation of 3D surface chart using XlsIO.